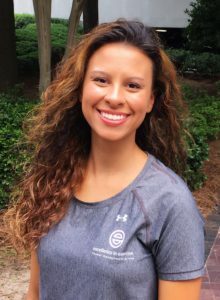 Kimberly Bland holds a Bachelor of Science in Exercise Science from Kennesaw State University and is a Certified Personal Trainer through the National Academy of Sports Medicine (NASM) and a SCW Certified Yoga Instructor. Kimberly has a diverse athletic background ranging from being a classically trained ballerina to an elite track and field athlete. In her training, Kimberly enjoys setting a fun and energetic atmosphere so that her clients can encounter fitness in a positive way.